Rosemary Branch Theatre is a reasonable twelve-minute brisk walk from Haggerston Overground and is quite a way out from other Fringe venues. However, it’s a fair sized gastro pub boasting a nice sized comfortable 55 seater theatre upstairs. Butterfly Powder is a four-act play comprising two acts either side of the interval from the extremely talented writer Jack Robertson. It is a very clever and well written dark murder mystery whodunnit style farcical spoof comedy. With a cast of nine superb actors and a plastic goldfish to choose from, in order to solve the mystery of who did do it? Mr and Mrs Fox take centre stage as they sit in their blow-up chairs, tolerating each other as they share the boredom of another morning while reading the local papers. The eccentric married couple are in their words “modern” which for this couple actually translates into rich, overprivileged and bored. Where the murder of an innocent young lady becomes the highlight of their mundane day! The comedy throughout this play is in abundance especially witnessing the couple falling to the floor during a couple of scenes out of sheer fear when the doorbell rings as neither of them knows what the noise could possibly be or what they are to do about it. The strange world of normality around them baffles the pair immensely. Mrs Fox played by Alice Marshall stole the show. Her wardrobe is befitting of the character Margo from the BBC comedy The Good Life. Her delivery was perfect, her comedy lines excellently timed and the accentuated upper-class breakdown of words such as paper pronounced “parpar” and toothache as “toothack” are delivered with precision. Her sarcastic sharp wit and body language made up fifty percent of her comedy role, beguiling the stage each time this actress was present. However, the eccentric, blundering role of Mr.Fox by Jack F Fairley complemented Marshall. He sought permission throughout the play to do everything. His desperation to smoke became an obsession, although Mrs Fox denies him permission each time he asks. There was a certain level of empathy towards him for he clearly found life very confusing due to always having a “maid” to take care of everything and marrying a dominant woman. Both actors showed a high level of skill and professionalism on a couple of occasions during serious scenes when the couple were in mid comedy banter. Marshall and Fairley held their composure and didn’t once burst out laughing although it was evident to see by their faces that they were both holding themselves together. No whodunnit would be complete without a body. As seen above their lies Miss Appleton-Fitz-Nightengale under a wardrobe. Have you ever questioned why your letterbox is called a letterbox, when it is simply a hole in your door? One of the many logical arguments Mrs Fox partakes in during the play. Her way of thinking in many ways took the form of a childlike innocence as to why you would wish to call it a box when it is nothing like a box! The dramatic blackouts signifying the end of the scenes and after each murder added another depth to the play. Heightening to the audience’s senses as we were plunged fully into darkness. Disappointingly though, this play was far too long at just under two and a half hours including a fifteen-minute break. This play requires some tougher editing. For example, Act Two would not have detracted from the storyline of the play if it had been cut out altogether. The randomness of two men meeting in the dark – one eating a bowl of soup while the other talks about soup flavours! This felt to be an extremely random addition to the play. The scene in itself has the potential to be a very good comedy sketch. Although there was a slight link to Mrs Fox as the storyline unfolded, it was not enough to warrant being there. Therefore what started as a potential four-star play has sadly been reduced to three by the end of the play. Too many characters and random editions slightly diminished from what started to be a strong and funny storyline. 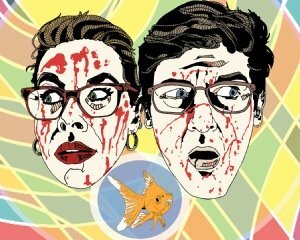 Butterfly Powder is a brand new absurdist play from acclaimed comedy writer and performer Jack Robertson. One half of the SketchFest 2016 winning duo Dirty White Boys, his clever writing and razor-sharp dialogue has seen them compared to Burnistoun and Mitchell & Webb. In this incredibly unique new piece of writing, Jack takes the much-loved traditions of classic farce and offsets them against the trials and tribulations of a modern world which demands perfection at every turn. Butterfly Powder takes a long hard look at what happens when societal pressure to maintain a flawless existence goes too far, all through the lens of absolute silliness and hilarious nonsense. Review wrote on behalf of London Theatre1.